“Murdered” anti-Kremlin journalist Arkady Babchenko appeared alive and well at a press conference in Kiev on Wednesday as Ukraine admitted it had faked his death to expose an alleged Russian plot to kill him. Onlookers gasped and applauded as Babchenko appeared, introduced by the head of Ukraine’s security service, who said the murder had been staged in order to foil an attempt on his life by Moscow. Less than 24 hours earlier, Ukraine said the reporter had died from three gunshots to the back in the stairwell of his apartment building in a contract-style killing in a case that provoked an outpouring of grief and a diplomatic spat. “Thanks to this operation we were able to foil a cynical plot and document how the Russian security service was planning for this crime,” security service head Vasyl Grytsak said at the press conference. Grytsak announced authorities had arrested the alleged mastermind of the plot, saying a Ukrainian citizen named only by the initial G. had offered to pay a hitman to carry out the killing after being recruited by Russian special forces and paid $40,000. Ukrainian President Petro Poroshenko later met Babchenko and wrote triumphantly on Facebook that “millions of people are celebrating” the journalist’s new lease of life. The planned attack was “organised from Russian territory” with the aim of “destabilising the situation in Ukraine” and “killing one whom Russia fears most of all,” he said. But Moscow,later Wednesday, condemned the staged assassination, the foreign ministry saying “now the true motives are beginning to be revealed for this staging, which is totally obviously yet another anti-Russian provocation”. 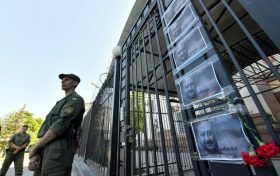 Foreign ministry spokeswoman Maria Zakharova said it was “great news” that Babchenko was alive but on Twitter she slammed the “propagandistic effect” of the set-up. Grytsak, during his press conference, thanked Babchenko and his family, who he said were in the loop about the secret operation. The reporter, however, apologised to his wife for putting her through “this hell she had to live through for three days…but there was no other option”. News of the “death” of the prominent Russian war correspondent and former soldier set off a series of recriminations between Kiev and Moscow, and pictures and flowers were laid by mourners at the Russian embassy in Kiev. Ukrainian officials led by Prime Minister Volodymyr Groysman accused Russia of being behind the killing of the Kremlin critic, a charge that Moscow batted back. Reporters Without Borders also condemned the faked death. “It is pathetic and regrettable that the Ukrainian police have played with the truth, whatever their motive… for the stunt,” Christophe Deloire, the head of the Paris-based media watchdog, told AFP. And Russian investigative journalist Andrei Soldatov, a former colleague of Babchenko, also questioned the value of the operation. “To me, it’s crossing a line big time. Babchenko is a journalist not a policeman, for Christ sake, and part of our job is trust, whatever Trump & Putin say about fake news,” he wrote on Twitter. “I’m glad he is alive, but he undermined even further the credibility of journalists and the media,” he added. He has contributed to a number of media outlets including top opposition newspaper Novaya Gazeta and is an avid blogger, accusing Russian authorities of killing Kremlin critics and unleashing wars in Ukraine, Syria and elsewhere. He wrote about his experience as a young soldier in the Chechen campaigns in a book published in English under the title “One Soldier’s War”. He has hosted a programme on the Crimean Tatar TV station ATR for the past year. Babchenko made a name for himself with his poignant reportages from the frontlines, including the conflict in eastern Ukraine that has killed more than 10,000 people.